Handy Backup allows centralized deployment of Network Agents via the dedicated Centralized Deploy utility. To the reference, see the main utility window on the next screenshot. To perform the centralized deployment, please follow the instruction listed below. Caveat: You must unpack the Centralized Deploy utility to a consistent folder, making no attempt to distribute the content of this archive by different folders. (depending of the current OS 32- or 64-bit architecture) in the Windows Explorer. In the next fields, type domains or names of machines and then usernames for installing the Network Agents. 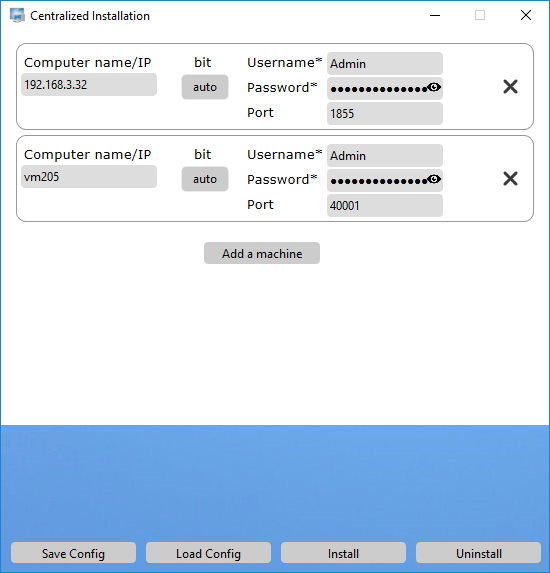 Select a type of installation (32- or 64-bit) for each machine if you need it (by default, the utility will select between 32-and 64-bit for each target OS). Note: This installation requires typing domain names or machine names before the username in the account! 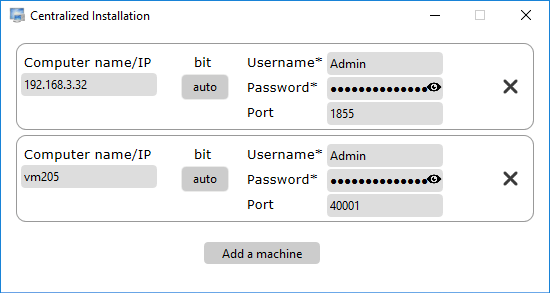 In addition, adding a new machine will copy a username and a password from the previous account, which is very useful when the administrator′s account is the same for all computers. Please consider that the Centralized Deploy utility keep all the passwords in the encrypted format! To clear a list of machines, click the "Reset list" button; it will erase all data you entered. You can save the setup configuration and restore it later using the appropriate buttons. Now your utility is ready to install. If you entered correct data, start the installation. This is all. Please configure your network edition of Handy Backup with the Network Agents you just install to remote machines!